A potent, multipurpose serum that combines breakthrough anti-aging ingredients like Vitamin C to help visibly minimize fine lines/wrinkles and reduce the appearance of age spots and discoloration. It boosts collagen production, fights inflammation and helps damaged skin heal. Water (Aqua), Sodium Ascorbyl Phosphate(Vitamin C), Haematococcus Pluvialis Extract, Sodium Hyaluronate, Hamamelis Virginiana (Witch Hazel) Extract, Aloe Leaf Extract, Glycerin, Rosa Canina Fruit Extract, Camellia Sinensis Leaf Extract, Xanthan Gum ,Chamomilla Recutita (Matricaria) Leaf Extract, Citric Acid, Potassium Sorbate. Apply a thin layer of serum over the desired area, allow drying. 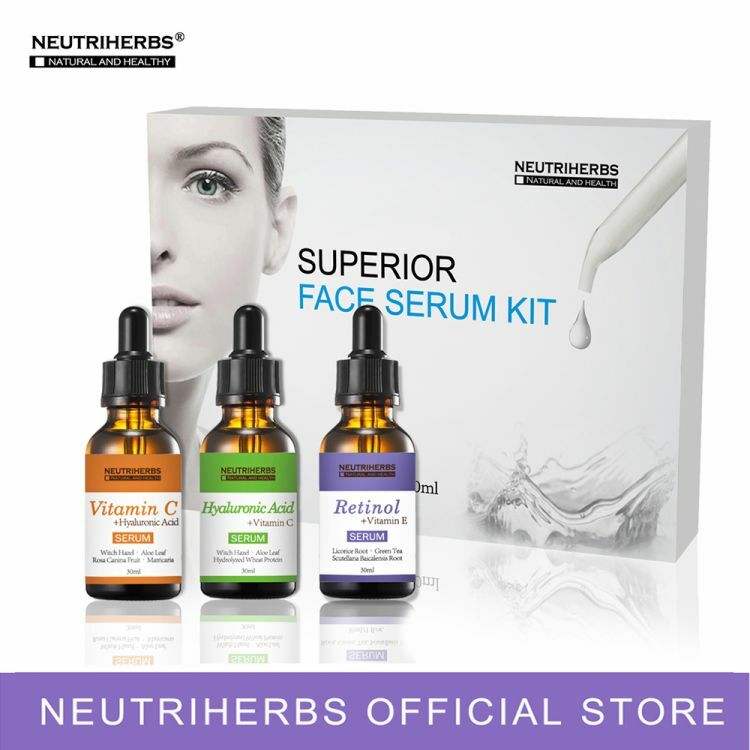 Neutriherbs Hyaluronic Acid Serum deeply hydrates and plumps skin to diminish fine lines and wrinkles, meanwhile, improve skin texture and brightness with intense moisture and balance. Rich with antioxidant Vitamin C, it leaves your skin soft, smooth, and rejuvenated. Neutriherbs Retinol Serum Combined with a synergistic blend of Vitamin E, Softens, it can unclog pores and clear up acne. Retinol has a molecular structure small enough to penetrate the lower layers of the skin, improves texture and tone for a smoother, softer, more radiant complexion, refreshed skin the moment you use it. 3. Apply a thin layer of serum over the desired area, allow drying. 4. After serum has dried completely, apply your favorite moisturizer. Discontinue using if redness or irritation occurs. Do not ingest.